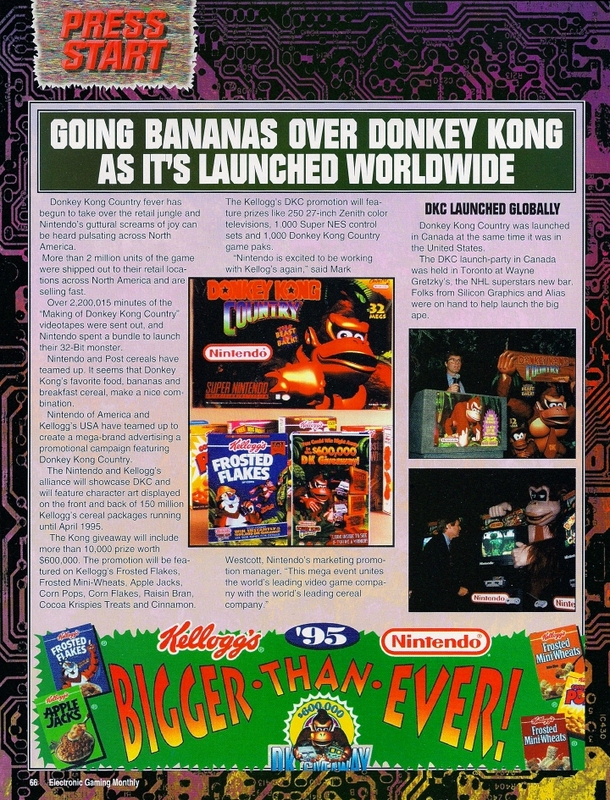 Before David Nelson Design, a Chicago-based design agency, worked with Kellogg’s to modernize its Raisin Bran mascot, “Sunny,” the two companies teamed up for a Donkey Kong Country instant giveaway in early 1995. According to Supermarket News, a trade magazine for the food distribution industry, the sweepstakes included 10,000 prizes ranging from Super Nintendo and Game Boy systems to Donkey Kong Country game paks and Nintendo apparel, watches, and stickers with a total value of $600,000. For its part, Nintendo of America ran full-page ads in Nintendo Power magazine and played a 16-second recorded message on the Game Play Counselor line to spread the word about the campaign. 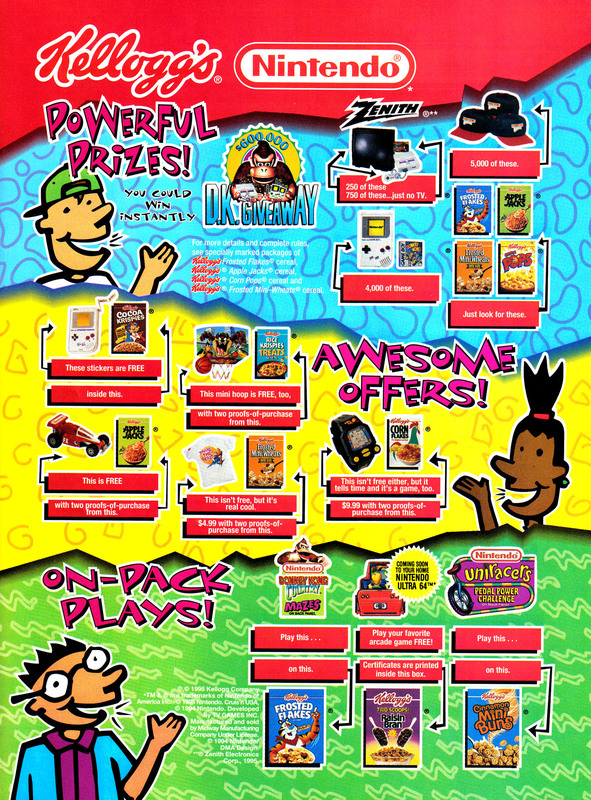 It was the third straight year that the game and cereal makers had participated in a cross-promotion (link). Electronic Gaming Monthly reported that Kellogg’s had plastered the hairy ape on 150 million of its sugary cereal packages, which just goes to show the magnitude of the marketing surrounding Donkey Kong Country. 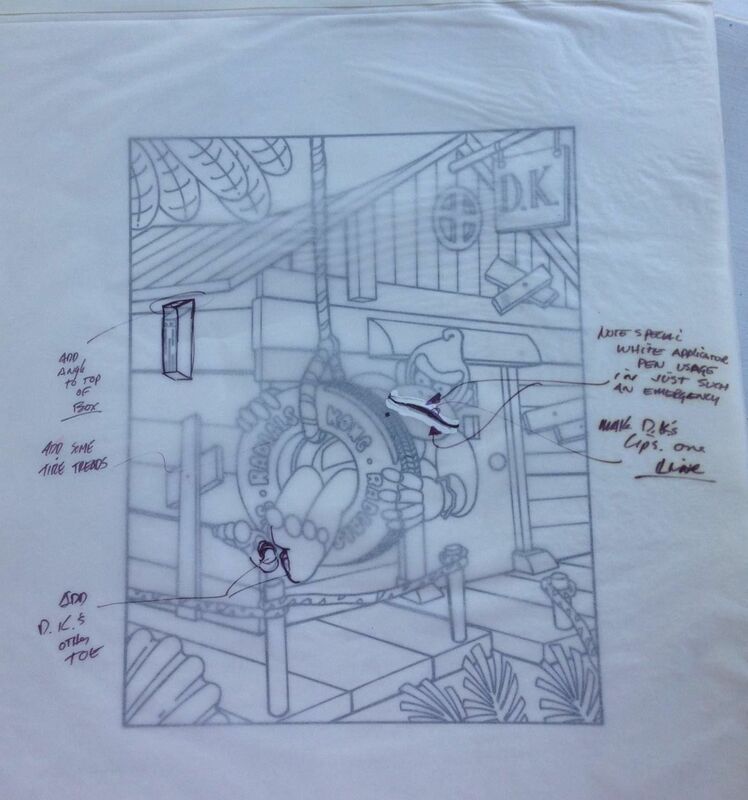 The line art pictured above was printed on the back of one of those Kellogg’s cereal brand boxes as an activity for kids to color while they ate their breakfast. 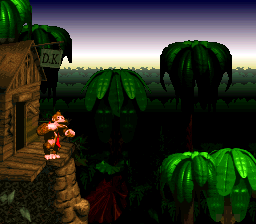 The scene depicts the opening of the game, outside of Donkey Kong’s treetop cabin on Donkey Kong Island, and appears to be based on official promotional artwork, which Nintendo Power used when the magazine carried a feature on Donkey Kong Country in September 1994, and then again an issue later to announce that full coverage was forthcoming. 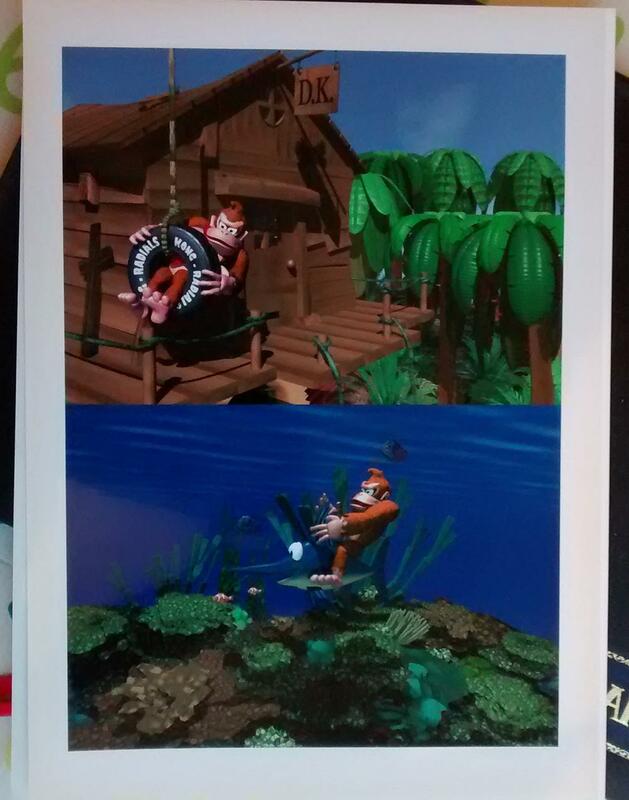 The art also shows up in the instruction manual under the Donkey Kong Country Atlas section. 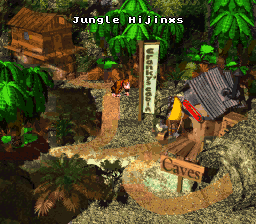 The primate’s polygonal appearance mimics the style of the Rare-developed adventure title, which famously utilizes pre-rendered graphics to create the illusion of a three-dimensional tropical world of rain-swept jungles, low-lit caverns, abandoned mines, monolithic ruins, snowcapped mountains, and tranquil coral reefs. 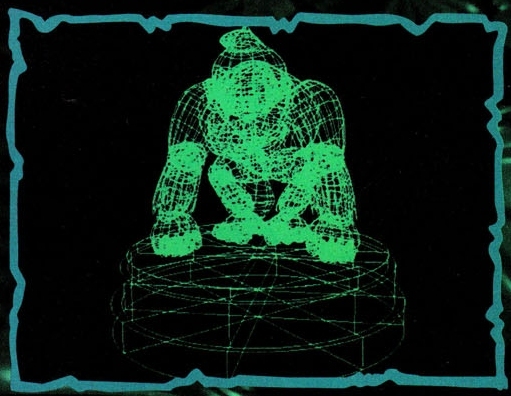 Working off an updated design by Donkey Kong creator, Shigeru Miyamoto, costly Silicon Graphics workstations, the same powerhouse computers that made the special effects in Jurassic Park and Terminator 2: Judgment Day, transformed the monkey into a wire-frame “skeleton” using Alias PowerAnimator software, the precursor to Autodesk Maya. Rare then manipulated and converted this advanced computer model into flat graphical tiles for the game. 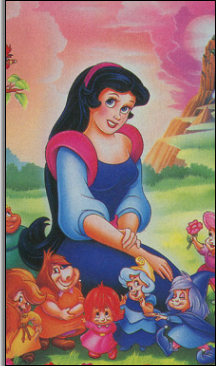 The original hand-drawn illustration measures 17 x 14 inches and was accomplished using ink on vellum. 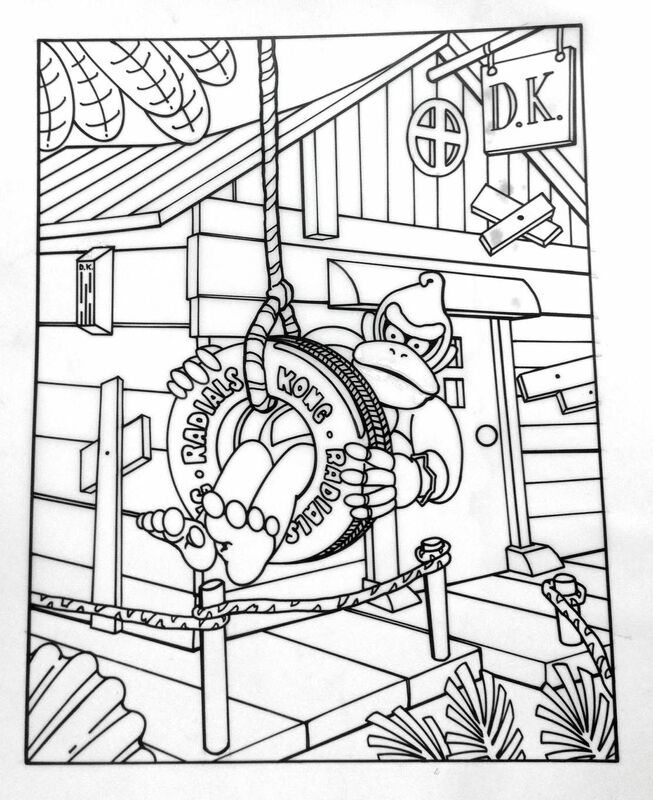 D.K.’s feet, which stick out of a tire swing, and his lips show signs of whiteout. 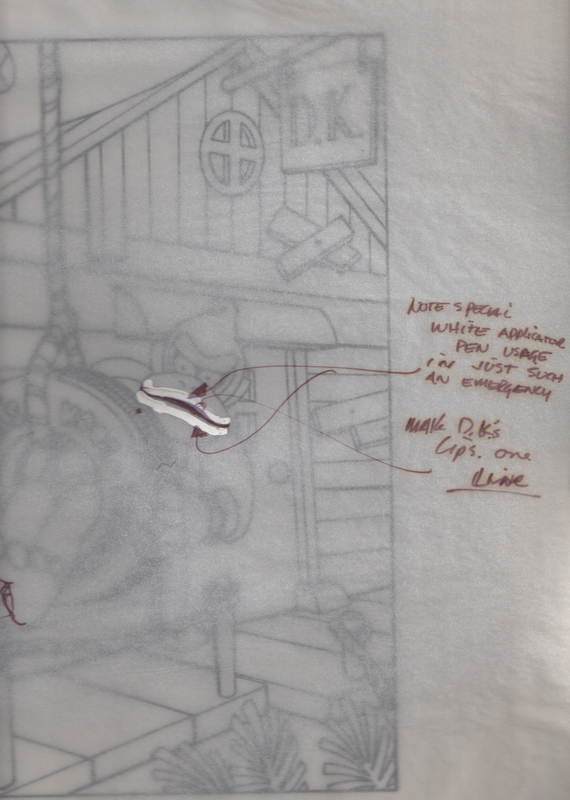 Attached over the vellum is an onion skin flap that contains the art director’s notes to the artist. 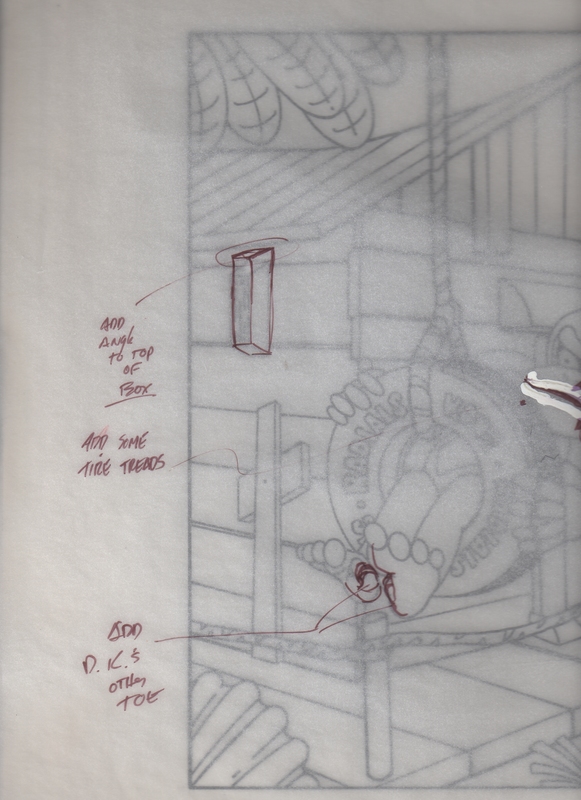 The first set of comments directs the artist to add an angle to the top of Donkey Kong’s mailbox, some treads to the “Radials Kong” tire, and draw in the gorilla’s missing toe. 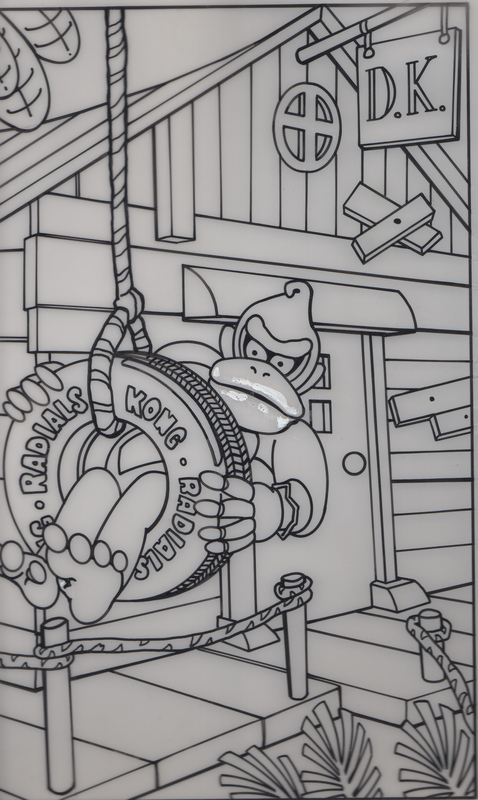 The last set of directions tells the artist to make Donkey Kong’s lips a single line through the use of a special white applicator pen. David Nelson Design also produced this 17 x 13-inch airbrushed painting of an overexcited Mario clutching a Super Nintendo controller for another Kellogg’s cereal. 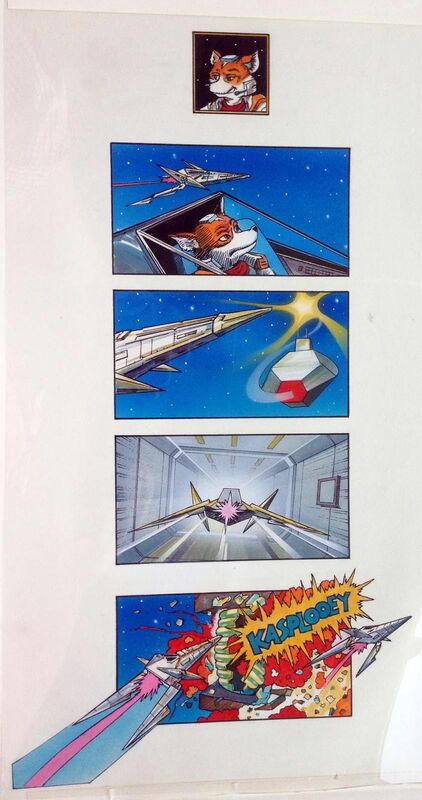 This last piece is a 21 x 12.5-inch Star Fox comic book-style paneling on board, done in paint and ink, which appeared on the back of Kellogg’s Corn Flakes in 1994 to promote a mail-order offer for a game watch. When asked who had drawn and painted all of this 16-bit-inspired artwork, David Nelson could not recollect any names. “As I recall, when art directing these boxes, Nintendo did not let us use just any old artist, they provided names of Nintendo-approved artists that we had to use,” Nelson told me. This was done in order to “protect their characters,” as Nintendo of America was very particular about how they should look. 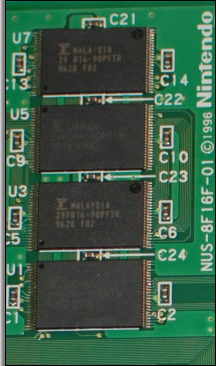 By the close of the contest in April 1995, 7.4 million Donkey Kong Country cartridges had sold worldwide. 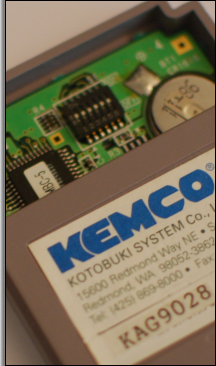 That month also saw the announcement of Nintendo’s multi-million dollar capital investment in Rare, which constituted a 25% interest in the UK company (link). 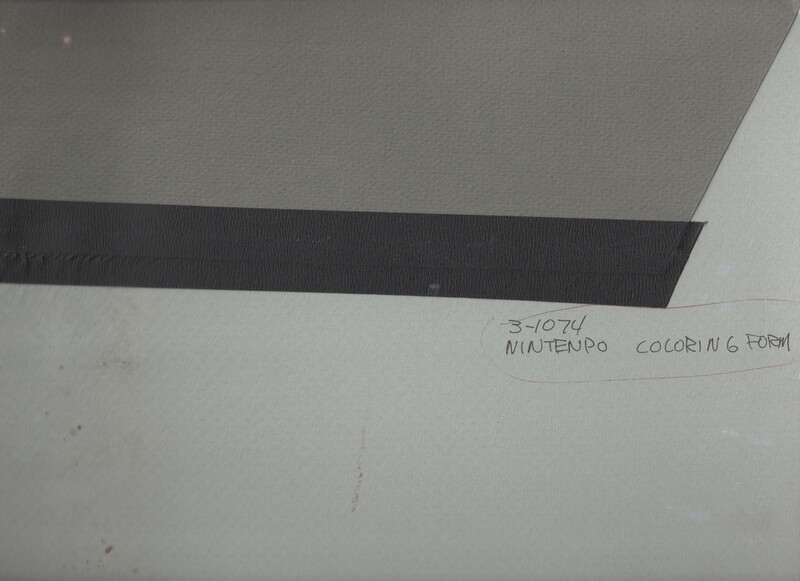 It was the first time that Nintendo had invested in a video game developer outside of Japan. 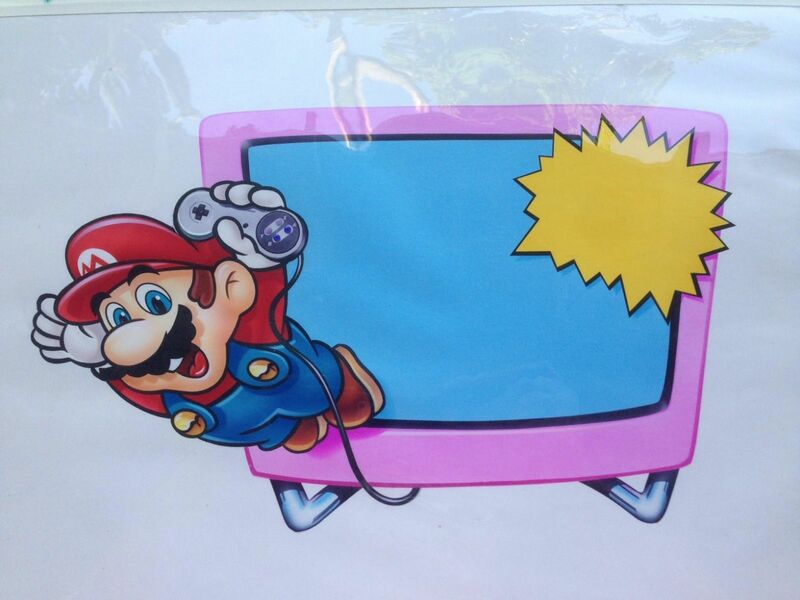 That business partnership would only grow in the years that followed, lasting up until the end of the Nintendo 64.